SS astronauts have modified a Russian-built Orlan spacesuit to carry a ham radio and antenna. It will be tossed into space during a Feb. 3, 2006 spacewalk by ISS Expedition 12 astronauts Bill McArthur and Valery Tokarev. When it comes to Russian spacesuits, what goes up, mostoften does not come down... at least not in one piece. 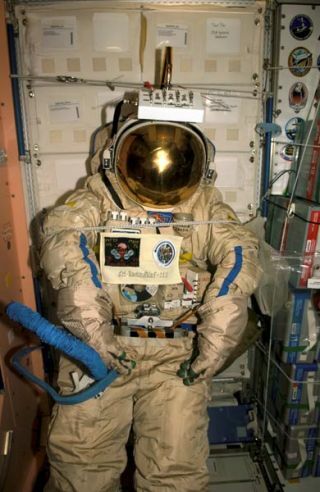 Russian Orlan spacesuits, which cosmonauts, and more recently, astronauts, useto perform spacewalks outside space stations, are designed to be stored,serviced and used again without ever being returned to the ground. Thelogistics required for landing a bulky Orlan is not among the capacity orcapability of Russian descent spacecraft. So, it won't be unusual when later today the crew ofthe International Space Station discards a spacesuit thathas outlived its usefulness during a six-hour spacewalk.How the astronauts, ISS Expedition 12 commander Bill McArthur and flightengineer Valery Tokarev, will do so however is rare, and what it will doafterwards is nothing but unique. On earlier Soviet Salyut stations, the suits used were left aboard to burn upin the atmosphere as the outpost itself reentered. Later, on Mir (and the ISS),old Orlans typically were stowed in spent supply ships and left to meet thesame fate. Occasionally though, their fiery end has been more creative. At least twice before, Orlans have bypassed riding home in a Progress vehicleto be thrown forcibly overboard by cosmonauts wearing their replacements. Thesuits were still destined to deorbit, but their exits took on the classicsci-fi scene of a stranded spaceman falling while flailing. Perhaps recognizing just such a potential, Mir residents Vasili Tsibliyev andAlexander Serebrov rigged their soon to be space junked spacesuit in October1993 to appear as though it was saluting. The send-off was said to have beencaught on film but the images have never (officially) been released to thepublic. That won't be the case today however, when all available cameras will bepointed toward Valery Tokarev as he gives Orlan-M no. 14 a good shove and sendsit soaring on its way from the ISS. Orlan-M14 (or more specifically, 1280014 as printed on its front) first arrived onthe ISS on September 16, 2001 with the Russian docking compartment Pirs(the same airlock that Tokarev and his crewmate William McArthur will exit andenter through today). Marked with blue stripes (as opposed to red) to facilitate identifying thewearer, no. 14 was first donned in space by Expedition4 Commander Yuri Onufrienko for a pair ofEVAs (extravehicular activities or spacewalks) in January 2002. Encased in theOrlan, Onufrienko (with crewmates Carl Walz and Daniel Bursch individually)extended a 50 foot cargo crane and installed two radio antennas and sixthruster deflectors outside the station. Next to wear the spacesuit was Expedition 5commander Valery Korzun, who, with U.S. astronaut Peggy Whitson on August 16,2002, and Sergei Treschev one week later, positioned debris shields,experiments and equipment (as well as two more ham radio antennas). More than a year later, Expedition 8commander Michael Foale became the last to wear Orlan-M no. 14 while on a spacewalk.He and crewmate Alexander Kaleri retrieved, relocated and deployed experimentsbefore their time was cutshort by a faulty cooling system inside Kaleri's Orlan. In total, Orlan-M no. 14 protected three crewmembers for 20 hours and 44minutes outside the ISS. When it leaves today, it will have been on the stationfor over four years. Before no. 14 becomes just another shooting star in the sky, it will take on anunprecedented mission. Equipped with three batteries, a radio transmitter andsensors to measure internal temperature and power levels, the Orlan will becomea satellite -- a SuitSat-- transmitting its condition to the ground. The telemetry will be preceded by aprerecorded greeting in five languages. Though its mission will be short-lived -- at most a week or two -- SuitSat willremain in its own orbit for as much as six weeks before re-entering theatmosphere. SuitSat is sponsored by an international group of volunteers fromamateur radio societies. Also "aboard" the Orlan is a CD with images of over 300 items -- art,signatures, logos and portraits -- collected from schools and educationalorganizations around the world. Students are being encouraged to try to detectthe signal beamed by SuitSat and listen for "special words" in itsmessage. Those who do can apply to receive honorary certificates. The transmission, which can be picked up by a receiver tuned to 145.990 MHz FM,begins with the words "This is SuitSat-1, RS0RS," and ends with a"Slow Scan" picture. The image is another secret for students to tryto identify. The SuitSat signal can be heard by listeners in the U.S.between about midnight and 4:00 a.m. for U.S. listeners due to its plannedorbit, NASA officials said. Students and other Orlan hunters can find out whenSuitSat will pass over their region of the world by visiting NASA's J-Pass web site. SuitSat's success may lead to more retired Orlans joiningno. 14, making the transition from personal spacesuit to orbiting satellite.